Carbon/carbon (C/C) is a unique composite material consisting of carbon fibers embedded in a carbonaceous matrix. C/C is originally developed for aerospace applications and its low density, high thermal conductivity and excellent mechanical properties at elevated temperatures make it an ideal material for aircraft brake disks. The materials properties of C/C are dependent on the fabrication process and fiber arrangement. In this study C/C brake disks fabricated by two different chemical vapor infiltration (CVI) processes, that is, temperature gradient (TG) and isothermal process were characterized to evaluate spatial variations in material properties attributed to fabrication process using through-transmission ultrasonic C-scan imaging technique. It was found that different behavior of densification of C/C brake disks could be clearly characterized by measuring the spatial variation in ultrasonic velocity. Through-transmission Ultrasonic C-scans with lower frequency based on both amplitude and time-of-flight (TOF) of the ultrasonic pulse were effective for mapping out the heterogeneity of material property of C/C brake disk. In addition, the correlation between ultrasonic velocity and porosity ratio of C/C composite was found. C/C composite is consisted of a fiber based on carbon precursors embedded in a carbon matrix and has such properties as low density, high thermal conductivity and shock resistance, low thermal expansion and high modulus. The C/C composite is applied for structures in high temperature condition, such as a brake disk of aircraft, a nozzle of rocket engine and etc., because C/C composite not only withstands high temperature approaching 3000oC, but actually increases in strength. Compared with the conventional metal brake disk of aircraft, the C/C brake disk has improvements in weight, resistance of oxidizing and wearing, strength at high temperature[1-4]. From these reasons, stators and rotors of aircraft brake system are made with the C/C composite material. However, the materials properties of C/C composite are dependent upon the fabrication process and fiber arrangement. In this study C/C brake disks fabricated by two different CVI processes were characterized not only to evaluate spatial variations in materials properties attributed to fabrication processes using through-transmission ultrasonic S-scan imaging technique. It was reported that the materials properties of C/C composite are strongly dependent on fiber arrangement of preform. It was known that conventional C/C composite brake disk was fabricated from a bi-directional carbon preform. However, three-dimensional preform is recently made by sticking with needle punch on laminate of carbon fabric reinforced in two-dimension, to enhance inter-laminar shear strength. After the preparation of preform, the densification process of carbon matrix in chemical vapor infiltration method is followed. 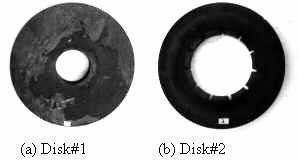 Two types of the C/C composite brake disk having two different CVI process for densification were used in this study as shown in Fig. 1. Disk#1 was fabricated by densification with temperature-gradient (TG)-CVI process. On the other hand, Disk#2 was fabricated by isothermal-CVI process. The outer and the inner diameters of C/C brake disks are 330 mm and 90 mm for disk#1 and 300mm and 146mm for disk#2, respectively. Fig 1: Configuration of C/C brake disks. Figure 2 illustrated the schematic diagram of two different CVI processes for densification. The matrix of C/C composite brake disk is carbonized from hydrocarbon gas (CH4) in high temperature furnace. There are various CVI processes such as Isothermal CVI, TG-CVI, and Pressure Gradient CVI . In Isothermal CVI process, densification is carried out in uniform temperature condition for 30-40days. In TG-CVI process, densification is, however, performed from center of the brake disk using high temperature heater, so that temperature gradient at inner and outer diameter of brake disk was existed. Fig 2: Schematic diagram showing CVI process. Since the C/C composite brake disk is porous material, the general ultrasonic testing is not effective because of high ultrasonic attenuation in the C/C composite material. In this study through-transmission ultrasonic C-scanning technique using relatively lower frequency transducers at 0.5MHz and 1MHz was used. The schematic diagram of experimental set-up is shown in Fig. 3. The ultrasonic velocity, V were measured by through-transmission method with Equation (1), where t is propagation time from transmitting transducer to receiving transducer, d is a thickness of carbon brake disk specimen, and Vw is ultrasonic velocity in water. The ultrasonic C-scanning was conducted by through-transmission method in water to measure transmitted ultrasonic amplitude and the time of flight(TOF). The TOF image represented ultrasonic velocity and the transmitted ultrasonic amplitude image represented attenuation and porosity in the brake disk. The relative porosity ratio of the brake disk was evaluated from Eq.(2). Density, r* is measured for bulk materials of the brake disk specimens which contain porosity and r0 is a density for powdered materials of the specimens to remove porosity. As mentioned above, ultrasonic C-scanning was carried out with relatively lower frequency at 0.5MHz and 1MHz to characterize the distribution of densification associated with two different CVI processes. The C-scanning images for disk#1 fabricated by TG-CVI process are shown in Fig. 4. In this Fig.4, concentric circles of brightness and darkness of C/C brake disk was observed in both TOF images shown in Fig.4(a) and the amplitude images shown in Figs. 4(b) and 4(c). In the TOF image shown in Fig.4(a), the degree of darkness is corresponding to short propagating time. Meanwhile, the amplitude images shown in Fig. 4(b) and 4(c), the darkness is mainly related to high attenuation caused from porosity in carbon matrix. It was found that the region of low velocity in the TOF image was corresponding with the region of high attenuation in the amplitude images. 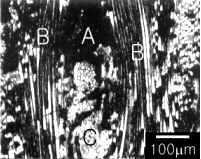 In addition, ultrasonic wave was scattered from the porosity caused by insufficient carbonization in the brake disk and hence the propagating time was increased. Therefore, the concentric circles observed in C-scan image for disk #1 fabricated by TG-CVI process is mainly due to temperature gradient caused during the carbonization process. The carbonization of the carbon matrix in the brake disk affected by the temperature gradient is controlled with heater in the center of disk as shown in Fig. 2. Therefore, the porosity could be controlled by adjusting temperature gradient of the disk. Compared with the TOF image, the amplitude images are sensitive to show porous region. The C-scanning images for disk #2 fabricated by isothermal CVI process are shown in Fig. 5. Comparing the C-scan image for disk #2 with those for disk #1, no concentric circle due to temperature gradient was observed for both the TOF and the amplitude images of brake disk #2. It was also found that the area with lower ultrasonic velocity at right hand side of disk in TOF image shown in Fig. 5(a) was corresponding to the area having high attenuation in the amplitude image. This implies that there are many voids, which are large enough to affect ultrasonic attenuation in this area. However, the ultrasonic attenuation is low at upper region of left side and lower region of right side of disk. It was also observed that the ultrasonic attenuation of lower region in left side is relatively high. Therefore, the amplitude images evaluate the degree of density more sensitively than the TOF images. Fig 5: 5 C-scanning images of C/C brake disk#2. The characteristic of anisotropy in ultrasonic velocity of C/C brake disk is found by measuring ultrasonic velocity in three directional plane of C/C composite. For this purpose, the sample of disk #2 was cut-out in shape of cube, as described in Fig. 6, then five specimens were prepared to measure ultrasonic wave velocities in three directions. The ultrasonic wave velocities, Vxx and Vyy are in-plane longitudinal velocities and Vzz is out-of-plane longitudinal velocity. Fig 6: Directional configuration for small cut-out of piece from C/C brake disk #2. The in-plane velocities, Vxx and Vyy is 4772 m/s and 4760 m/s respectively, as shown in table 1. However, the out-of-plane velocity, Vzz is 3097 m/s that is 65% of in-plane velocity. It was expected that this C/C composite brake disk is the transversely isotropic material from this result of these ultrasonic wave velocities. Therefore, other in-plane velocities, Vx'x' and Vy'y' were measure in inclined direction to prove that this brake disk is the transversely isotropic material. It is estimated that the difference between in-plane ultrasonic wave velocity and out-of-plane velocity shows different fraction of carbon fibers in horizontal (in-plane) and vertical (out-of-plane) direction. Porosity was also measured from the density of bulk material, r* which was calculated with the volume including pores and density of powdered material, r0 which was calculated with net volume of specimen without pore. The density including pores, r* was 1.68~1.79 g/cc, and the net density, r0 was 2.30~2.53 g/cc. Therefore, averaged porosity was 27%, as shown in Table 1. Fig 7: Relationship between porosity and Vxx. Fig 8: Relationship between porosity and Vzz. The correlation between the porosity and the longitudinal velocities is shown in Fig. 7 and 8. As shown in these figures, the relationship between ultrasonic velocities in both planes and the porosity shows linear relation and indicated similar relationship for both in-plane and out-of -planes. Fig 9: Frequency spectrum (C/C disk#2). Frequency spectrums of the ultrasonic wave obtained by through-transmission technique are shown in Fig. 9 (a) for 0.5MHz transducers and (b) for 1MHz transducers for the brake disk #2.. The peak frequencies are lower than 0.5MHz for both of them. High frequency component was attenuated by scattering in propagation through porous C/C materials where the pore size was larger than 10% of wavelength. Since, 0.25MHz and 0.3MHz was peak frequency in ultrasonic wave signal obtained at 0.5MHz and 1MHz transducers, respectively, and dominant frequency component is less than 0.5MHz. It is estimated that there are a lot of pores larger than 300mm in the C/C composite brake disk. Figure 10 shows the microstructures of in-plane surface of C/C brake disks fabricated by two different CVI processes. Region A indicates some pores in the C/C composite material, B is in-plane carbon fiber reinforced, and C is out-of-plane carbon fiber. 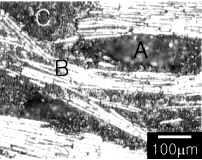 The carbon fibers which reflect the light in micrograph are shown as bright columns (in-plane) or bright small circles (out-of-plane). The out-of-plane carbon fiber, C was oriented vertically by sticking with needle punch as mentioned earlier. The size of pores observed is larger than 200mm and there are numerous pores observed in the C/C composite brake disk. The ultrasonic attenuation mentioned earlier resulted from ultrasonic scattering at these large pores. Fig 10: Microstructure of C/C (X100). The C/C composite brake disks fabricated by two different CVI processes for the densification were characterized nondestructively by through-transmission ultrasonic C-scanning technique. It was found that the C-scanning images represented the degree of densification correlated with the pores which observed in microstructure of the C/C composite brake disk. The amplitude images evaluated the degree of densification more sensitively than the TOF images. The concentric circles due to heterogeneous densification were observed for brake disk of TG CVI. The attenuation of higher frequency components than 0.5MHz shown in FFT spectrum caused from the scattering in numerous pores which were larger than 10% of the wavelength. This implies that lower frequency transducer such as 0.5MHz is acceptable for ultrasonic evaluation of C/C composite materials. The ultrasonic velocities were mainly related with the fraction of reinforced fibers in each direction. It was found that these C/C brake disks were the transversely isotropic materials from these velocities. In addition, the variation of the ultrasonic velocities were related with porosity. Therefore, the fraction of reinforced fiber could be evaluated with measuring ultrasonic velocities in same densification condition. Schmidt D. L., Davidson K. E., Theibert L. S., "Application of Carbon/Carbon Composites" 42nd International SAMPE Symposium, p1482-1493, (1997). Zou L., Huang B., Huang Q., Zou Z., "The Characteristic of Friction and Wear for Randomly Oriented Chopped Fiber Reinforced Carbon/Carbon Composites", International Symposium of Carbon(Tokyo), (1998). Kustas F. M., Manson R. R., Summers J. L., Miyoshi K., "Tribological Performance of 3-D Carbon/Carbon Composite-Part II: Vacuum Environment" Journal of the Society of Tribologists and Lubrication Engineers, Vol. 52, p149-154, (1996). Sedghi A., Fard F. G., "The Effect of Graphitization on the Mechanical Properties of Two Dimensional Carbon/Carbon Composites", Mat. wiss. U. Werstofftech. 28, p236-240, (1997). Windhorst T., Blount G., "Carbon-Carbon Composites: a Summary of recent Developments and Applications", Materials & Design, Vol. 18, No. 1, (1997).